It has been a while since the last update on this blog. The 2nd half of the year has always been a very busy time for musicians. For me, I have been through some recitals of my works, a major annual concert of St Laurentius Chamber Orchestra, an ABRSM exam, Yamaha exam, another experimental instrument, and off course, many "entertainment" performance, music arranging, and loads of teaching. Behold, a new generation of wind instrument has arrived! Well, it is my original design, the flutarina, a flute - ocarina hybrid. 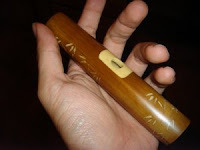 It's made of bamboo, which is a traditional material for flutes. It also has the flute embouchure hole. But the embouchure hole is located right in middle of the instrument, making the acoustic closer to ocarinas than flutes. unlike flutes, the hole size plays more important role than location. This instrument has 9 finger holes, 2 of which are the natural hole formed by b amboo ends, operated by thumbs. It is pitched in Eb, with a range of approximately from middle C up to Bb (nearly 2 octaves). Just like ocarinas, overblowing doesn't work on this instrument. It features internal lacquer (white colored), embouchure hole and finger holes inlays, bamboo-tree carving, and a matte-lacquer finish. I haven't figure out all of the fingerings yet, but I believe full chromatic should be possible. Because it is basically a stopped pipe, its length is about half of that required for a flute with the same pitch. May I call it the eco-flute? Another nice thing about it is its extreme ability to pitch bend. 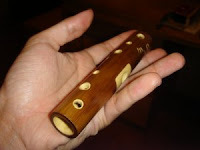 And the thumb-operated end-holes can serve as a special effect device simillar with the koudi (The koudi is a very very short flute with no fingerhole used to imitate bird songs). I figured that using a funny embouchure and fine control, it is possible to play multiphonics on the trumpet, especially in the high register. The sound is unstable and not very musical, just like any other wind instrument multiphonics. But I guess a good composer out there might find a good use for this unique voice, and a good player might figure out how to do it reliably. If you don't get it, it is the vibrating sound between the two notes. It is unstable as it easily drops into either one of the more stable tones. But when everything is correct, the funny vibration comes. I know it sounds weird because of the funny embouchure involved, but it is an ordinary Bb trumpet, a Constellation, not a clarinet or some weird custom-made instrument. And, No! It doesn't involve playing while singing the 2nd note. I finished my first Shakuhachi, the Japanese traditional end-blown flute. Following the "standard" specification, it has 5 equal sized finger holes, beautifully arranged at even spacing of 1/10th of the flute's length. After drilling the bamboo nodes to create a continuous pipe, the bamboo was initiated with fire. The heat treatment process left burn marks on the bamboo, which I found aesthetically appeasing. The next step is cutting the utaguchi (blowing edge) at the end of the bamboo. Finally, the finger holes were drilled. Fine tuning was done by adjusting the finger hole size and adding or removing materials from the bore. For finishing, the word Shakuhachi (in Japanese character) was inlaid at the back of the utaguchi. Then three strips of rattan binding was introduced. The strips served as decoration as well as adding some strength to the bamboo. In the middle of the night, when I was recording the last track for the ending credit of the movie KURSInya, my mic started to introduce a very annoying constant clicking noise. It was rather loud and occurs approximately every half second. Tinkering with the cable connections did not help, so I decided to open the microphone. Due to its weird construction (it is a cheap dynamic microphone) I had to cut the cables to take out the mic out of its casing. I found that wiring the mic ground connection into a large, electrically isolated body reduces the noise. So I proceeded and finished the recording session. However, the problem persists. The noise is reduced, but never fall to zero. The worst thing about it is I cannot put the mic back into its casing (I still cannot find a way to open it). So it is now hanging, naked on the stand. New recording of Carawitta and Fugue for two guitars are now available on Youtube. Played by Oskar Satria and Riston Adenan, in Substantially Guitar Concert, Jakarta, 2 Mar 2008. Thanks to Sudirman Leman for uploading the performance. I've finished my project of writing the Indonesian Rhyming Dictionary, or "Kamus Rima Bahasa Indonesia". Hopefully this book can soon be released to the public. Currently in the process of finding a publisher. beta bercerita nyata, beta meminta cinta wanita jelita berkacamata, juwita berpita magenta. Pendeta buta renta berkata terbata bata, serta merta bersukacita, berpesta bergempita beserta anggota tahta mahkota junta pendusta. Ternyata, penderita kusta ternista serta anggota kasta jelata, mengkudeta, bersenjata, meminta harta permata, bercita cita menata gulita dukacita, mencipta pelita sukacita. "Kita terlunta lunta, penderita tata kota. Junta menyita harta, kereta, talenta, unta ... Vendeta!!" Dewata semesta, beta meminta cinta wanita jelita berkacamata, juwita berpita magenta. Fakta berkata, "meronta ronta! ", wanita berkata "airmata", junta berkata, "Anumerta." In Stravinsky's time, the most important element of music is the harmony, an old idea propagating from the romantic era. Today, most musicians' still judge the quality of a composition from its harmony. However, I noticed that it is no longer true among non-musicians. They are much more inclined to hear the rhythm, and do not really care about the underlying harmony, even the melody. So here it is, a piece of solo guitar with irregular time signature, that I believe is easier on 21st century ears. I plan this piece to be a part of a larger scale work, so there will be more movement coming. A friend of mine, Syarif Maulana, had a concert last year. I contributed a composition for two guitars. It was premiered at his concert, 9 November 2007, with another young guitarist from Jakarta, Johan Yudha Brata. The piece features an interplay between a baroque style music with Indonesian traditional music. The long awaited recording of "Varition of Selendang Sutera" is now available from youtube. This is the 4th performance of this piece (premiered December 2006), performed by the piano virtuoso Ananda Sukarlan. Thanks Chendra for uploading the video. "Selendang Sutera" (the silken scarf) is an Indonesian nationalistic tune by Ismail Marzuki. It tells a story about a soldier who received a scarf from his lover before he went to war. During a battle his arm was wounded. He used the scarf as a bandage, survived, and return as a hero. The score is available here. It looks like the folks in Prodia Lab (a health laboratory) really like to sing and dance. A few months ago a nation-wide competition was held between Prodia's branches to create the best song (about the company) with choreography. So one of the branch in Bandung asked me to write one. So I did it. I wrote a song, arranged it, and recorded a minus-one for them to sing along. Thanks god, they received the 1st prize with this song. So ... they want to make another one for another national gathering between their marketing staffs. Yes it is just a gathering, no competition. With one note, they want it in the salsa style. So here is the minus-one, Salsa! 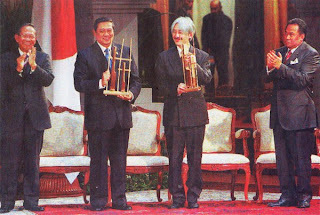 This is a picture from Kompas, showing Indonesian President Mr. Susilo Bambang Yudhoyono (2nd from left) and Prince Akishino from Japan during the prince's visit to Indonesia on January 2008. Both men are playing angklung, one of my favorite native Indonesian instrument. The funny thing about this picture is that the Japanese prince held the instrument correctly (although at a slightly wrong angle), while the Indonesian president was totally wrong.